Ahhh the pumpkin spice latte. People impatiently wait for it all year long, and once Labor Day hits, it's all the rage. You can make your own at home. You can turn it into a cupcake. Or even ice cream! And now you can make pumpkin spice latte blondies too. 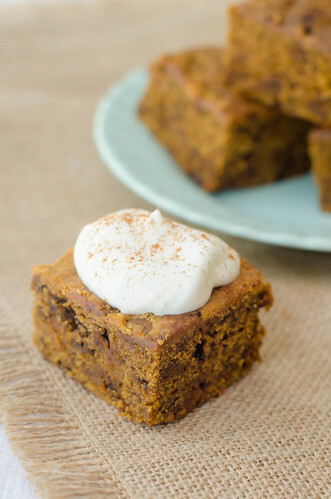 I took an old favorite recipe - pumpkin blondies - and gave them the PSL treatment. A hefty dose of instant coffee (or espresso powder), some extra cinnamon flavor, and I topped them with a dollop of whipped cream. The result is a deliciously pumpkiny blondie with that addictive spice from the cinnamon and nutmeg, and a subtle taste of coffee. And the best part? A baked good based on a coffee drink is a perfectly acceptable breakfast. I used cinnamon chips, which I know can be really hard to find. If you can't find them, just leave them out and add some extra cinnamon. Two teaspoons of instant coffee produces a blondie that has a subtle coffee flavor. If you want a stronger flavor, increase the amount. Or use instant espresso powder. Line bottom and sides of an 8x8 inch baking pan with foil, leaving an overhang on all sides. Spray foil and sides of pan with cooking spray. In a medium bowl, whisk together flour, pie spice, baking soda, coffee, and salt; set aside. With an electric mixer, cream butter and sugar on medium-high speed until smooth; beat in egg and vanilla until combined. Beat in pumpkin puree (mixture may appear curdled). Reduce speed to low, and mix in dry ingredients until just combined. Fold in cinnamon chips. Spread batter evenly in prepared pan. Bake until edges begin to pull away from sides of pan and a toothpick inserted in center comes out with just a few moist crumbs attached, 25 to 35 minutes. Cool completely in pan. I actually haven't had a PSL yet this season! Shame on me. I should make up for it by eating a whole tray of these. Oh, yum! These look wonderful!!!! :) I could definitely eat a few (or 20) of these right now. tats beautiful....pumpkins are such versatile veggies :) we could make anything out of them! Whoa. Is there anything pumpkin can't be added to? I don't even LIKE pumpkin that much, but this fall I finally succumbed to pumpkin peer pressure. These look incredible! FYI - most Wal-Marts carry the cinnamon chips. If I can find them here in Alaska, you should be able to find them at yours! So obviously, I'm totally baking a batch of these this weekend. Sans cinnamon chips, since they're impossible to find up here in the Great White North, but I'm sure they'll still be fantastic. Mmmm...these look so good-I could use one or two with a cup of coffee! Fantastic post! I made these tonight and I love them! I had some leftover pumpkin puree so this was the perfect recipe to use it up. Thank you! made these and turned out great. Didn't have cinnamon chips so used TJ's cookie spread instead. Delicious. I made these with pumpkin spice M&M's this morning and they turned out great! something new? I want to motivate you. Maybe you have some ideas you can share.